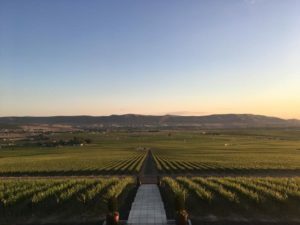 The 2018 National Viticulture & Enology Extension Leadership Conference (NVEELC) took place May 20-22, hosted by Washington State University (WSU) Viticulture Extension in Prosser–the heart of Washington State wine country. The 50 extension and outreach specialists who attended represented both viticulture and enology, their experience ranged from 30+ years in their post to less than six months, and they spanned grapegrowing regions from North Dakota to Texas, California to Kansas, Georgia to New Jersey, Missouri to New Mexico, New York to Washington and Oregon. NGRA was proud to help support the event. See photos from the event on the NGRA Facebook page. NVEELC 2018 was made possible by host WSU and sponsors G.S. Long Co. Inc., J. Lohr Vineyards and Wines, Oregon Vineyard Supply, Ste. Michelle Wine Estates, Washington Winegrowers and Wilbur-Ellis. And travel scholarships provided by the California Association of Winegrape Growers, California Table Grape Commission and E.&J. Gallo Winery enabled five extension specialists to attend. NVEELC 2019 will be held in Texas, with exact dates and location to be announced. If you work in extension or outreach, we hope to see you there!